A Man with Sword Subdues Portland Police Officers / You're kidding, right? Ms. Hovde’s article is somewhat tongue-in-cheek, but she has described a very real problem with modern law enforcement. Basically, is law enforcement starting to ‘pull-back,’ concerned about confrontations that might lead to a civil suit or public criticism – even if that decision might subsequently put the public in danger? In my opinion the answer is ‘yes.’ The officers were apparently dealing with a mentally troubled individual armed with a potentially deadly weapon. However, when the man would not give-in to their demands after being shot several times with a bean bag gun, supervisory personnel decided they’d just call it night – and hope he didn’t kill anyone. Is this what the motto: ‘To Serve and Protect’ implies? Apparently, that is the case around this locale. Maybe the Portland Police Bureau needs a new motto? Some of you might have some good ideas. Portland police administrators may have a justification, or more accurately a rationalization, as to why their officers walked away from a mentally ill man brandishing a sword in a public area; but, under the described circumstances, I can’t really think of a really good one to offer; but I will give it a try. The reported criminal act alleged was 'brandishing a sword and scaring the public.' The police categorized that crime as ‘Menacing,’ which is a misdemeanor under Oregon law. When the police arrived the ‘victims’ (who had summoned the police) had left the scene. Police can’t make a misdemeanor arrest unless it occurs in their presence – and they might say that the ‘victim or victims’ were not present to file a complaint, therefore they have no basis to arrest – a somewhat tortured logic under the circumstances. However, it has been my understanding that throwing rocks at police officers, while brandishing a deadly weapon, would constitute at very least misdemeanor assault, disorderly conduct and/or probably ‘menacing,’ which would land you in the hoosegow under most circumstances. It would appear that crazy courage has a demoralizing effect on our local gendarmes. Perhaps, they should have called the SWAT Team. Well, maybe SWAT quits at midnight too – and you know how that overtime money can drain a police budget. Good news: Apparently “sword guy” has not killed anyone so far – at least no one we’ve discovered. I wonder if they ever identified this guy. Oh, I guess it doesn’t really matter. This is about The Confederate Battle Flag; and a thought precipitated by a discussion with a friend. 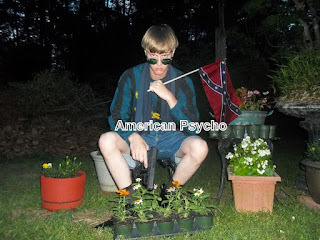 So now, it appears, The Confederate Battle Flag is directly, indirectly, or incidentally associated with / responsible for the mass murder at the Mother of Emanuel Church in Charleston, SC, on 6-17-15, by Dylann Storm Roof. I probably don’t have ‘standing’ to have an opinion on this subject. I’m not a Southerner, or Black and never had any ancestors – as far as I know – who fought in the Civil War. I guess my main thought is how easily public opinion is manipulated; and how deceptively politicians pervert and use to their advantage almost any tragedy. It really is unconscionable. Now, some doofus politician, Mayor Mitch Landrieu, wants to tear down the statue of Robert E. Lee in Lee Circle in New Orleans. “Symbols really do matter”, he so eloquently, if not originally, opined. Alright, citizens of New Orleans go ahead and tear it down. This Oregonian couldn’t care less. But, I do think you’re getting your patties in a bunch about pretty much nothing. For those who are familiar with the basic facts of the Civil War, the South was not just defeated, it was destroyed. If a Southern Civil War hero is revered by the South, so what? If a small token, a flag, is a form of solace, I say what can it hurt? General Grant, the Union victor, treated Robert E. Lee with respect and honor during the surrender at Appomattox in 1865, even though he could have had Lee hanged – which is what Lee actually expected would happen. Where are we going with this process anyway? Should the statues of Jefferson and Washington be torn down? As most of us know, they owned slaves. Whereas, the vast majority of the Southern soldiers who were killed or maimed during the Civil War never owned a slave. If some flag (and it is an American flag after all) gives some people a bit of sentimental remembrance and respect for those soldiers who died when duty called. Well, as far as I’m concerned, let it be. It’s interesting. 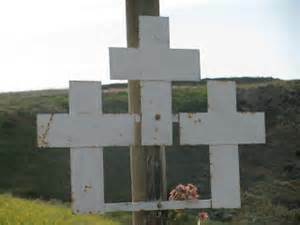 First off, the State of Montana does not run the ‘little white cross’ program. Since 1953, this program has been promoted and maintained by local chapters of the American Legion. They have received the endorsement of several Montana governors, but apparently no significant State funds are expended. The State has participated to some degree in erecting signs, upon entry into Montana, explaining the highway ‘cross’ meaning. The crosses are not meant as a memorial to any particular person; nor (officially) is there any religious connotation intended. The ‘cross’ purpose is to raise awareness among the public; and increase motor vehicle safety. The crosses are not in every county, but are in most. There is one cross for “each fatal accident,” which makes one wonder about the five crosses displayed together that I noted in my previous post. I guess it depends on how you count fatal accidents (body count or actual accident count). The dimensions and manner of presentation for each cross is consistent state-wide. They are not to be decorated – although clearly many are – apparently by friends or family of the deceased. When a road is improved the cross is removed – unless a family member specifically requests a new cross be installed. Furthermore, family members can request that a cross not be installed at an accident scene; or that they would like to have a cross removed. The Mothers against Drunk Driving (MADD) and the Montana Highway Patrol have praised the program. So who am I to disparage it? Now that I know more about it, I guess it’s OK – but, I still feel it is a little bizarre. Well, Montana has 1.96 fatal motor vehicle deaths per 100 million vehicle miles driven. Oregon has .94 deaths. In other words, Montana roads are twice as deadly. Apparently, the ‘little white crosses’ are accomplishing very little. Oh, regarding motorcycle deaths, remember I previously mentioned the inordinately high speeds on some roads and no helmet requirement in Montana. Well, I did find some statistics on that. Although Oregon’s population is three times the population of Montana, the number of fatal motorcycle accidents is pretty much the same: In 2013, Oregon had 34 deaths (32 were wearing helmets). In 2013, Montana had 35 motorcycle fatalities (12 were wearing helmets). I recently returned from a trip to Glacier National Park. Yes, I occasionally do other things besides this blog. The Park is, of course, in Montana and is spectacular; but this is not a travelogue. 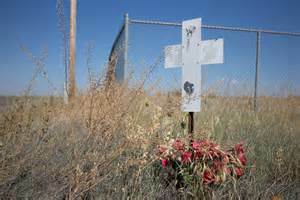 This is about the little white crosses that dot the Montana highways. Each cross indicates a traffic fatality at a given location. Now, I must say that I initially found them to be kind of morbid and distasteful. Imagine riding along with your small children or grandchildren and explaining every few miles, ‘Yes, someone was killed here in a car wreck.’ However, even children would grow bored with the concept after a while; and so, perhaps, that's nothing to be particularly concerned about. At one location there was a rack of five crosses displayed – apparently five people died – probably in the same accident. It seemed strange. It was a straight stretch of road. One might tend to imagine the intoxicated driver, flying high on alcohol or the recreational marijuana he purchased in Oregon or Washington (my apologies to those who smoke weed responsibly), crossing the center line and plowing into a family’s minivan. I was thinking all these things as I was rocketing along a rather curvy road at seventy MPH. Say what, you ask? Yes, Montana’s infatuation with little white crosses is complimented by their excessive speed limits along some questionable two-lane roads. Seventy is quite common. Now, because I’ve matured over the years, I tend to slow down on the curves; but, I’m not sure that I would have done that at eighteen – due to my then immature and perhaps more literal understanding of what the speed limit meant. Furthermore, Montana, interestingly, does not require helmets on motorcyclists who also travel seventy plus along these curvy roads. Which, I’m sure can be a lot of fun. It has also brought the state, I would imagine, an abundant supply of organ donors – incidentally or purposely, I’m not sure – organs for a little white cross – seems fair. Anyway, those were my thoughts. So, I decided to look into it. Is there hope for the future? Sometimes, I think there is. It’s odd the things you learn in childhood that stick with you through a lifetime – strange things. Do you know that I still bend down to pick up a penny that I see lying on the sidewalk or in a parking lot? “See a penny and pick it up and all day long you'll have good luck.” My mother taught me that rhyme as a small child. These days, of course, a penny is basically worthless. I no longer need the penny, never did really; and, quite frankly, picking up a penny requires more effort as the years go by. In fact, I almost feel a little embarrassed when I do it; but I do it nonetheless. Why? As I grew older, I interpreted the rhyme to mean that, if you’re so prideful that you would not bend over and pick up a penny, you don’t deserve good luck or good fortune. And, moreover, it takes so little effort... well, why not? Here’s where I segue into a recent experience I had. It was nothing I suppose. But, it’s funny how it impressed me. I was in McDonalds. Don’t get me wrong, I don’t eat there much (hardly ever), but I do occasionally stop for coffee. Oh, I can afford to go to Starbucks and I do once in a while. The demographics are different in Starbucks. That’s for sure. 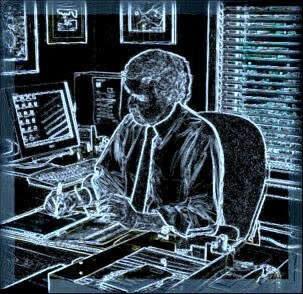 Many of the customers are fixated on their laptop computers and cell phones. Generally, Starbucks customers are slimmer, tidier, more mannerly, and presumably better educated. But… Have you ever heard the saying (It’s a country song by Lester Flatt): ‘Don’t get above your raisin’? Meaning you better remember where you came from. I try to do that – remember that is. So, to continue, I walked into McDonalds. There was a line of three boys, probably sixteen or seventeen, waiting to place their order. I formed-up behind them. The boy in front turned to me and said, “You go ahead sir.” I went to the front and ordered my senior coffee. I turned to him and said ‘thank you.’ I wanted to say that you must have great parents, but I didn’t. He probably wouldn’t have understood why I said that anyway. I know this isn’t a big deal. It just one of those little transitory life situations that gave me a bit of hope for the future.